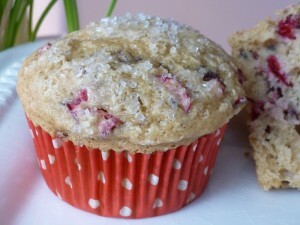 When I saw the Cranberry Vanilla Muffins from the November 2010 Traditional Menu, I just had to adapt them! And the easiest adaption is to use my Gluten and Dairy Free Fresh Fruit Vanilla Muffins. Easy-Peasy. Obviously fresh cranberries might be hard to get right now, so feel free to use frozen. I like this muffin also with black cherries, strawberries or blueberries. Yum! I dressed to top of the muffin with a bit of turbinado sugar to give it a touch of sweet crunch and that coffee house flair. Preheat oven to 350 degrees F. Line a muffin pan with paper liners. Set pan aside. In a mixing bowl whisk the dry ingredients together well. Mix in the wet ingredients, except cranberries until batter is smooth using a mixer. Do not over beat. Fold in fruit. Fill muffin tins ¾ full with batter. Bake for 20 – 25 minutes at 350 until muffins are done, using a toothpick or thin sharp knife to see if batter is baked through. Cool muffins on a wire rack. Freezing Directions: Cool muffins completely. Put into a gallon-size freezer bag. Remove as mush air as possible, label and freeze. To serve: Thaw. Eat at room temperature or warm slightly.